Learn more about Dashboard, Assets, People, or Accounts options. When you move the mouse cursor around the stage area the top toolbar will show the current x, y, and Z coordinate. Note! The Z coordinate will be equal to the project Sea bed level value unless Bathymetry data is loaded for the project. If that is loaded then the current Z value of the Bathymetry data in the X, Y position will be shown. The stage area can be viewed in either "2D", which is also the "Layout" mode e.g. you can design your field in it, or in "3D". The 3D view is a view only mode that allows you to view your subsea and topside layout in 3D. You switch between 2D and 3D by clicking on the designated 2D or 3D icon at the stage toolbar. You can zoom in and out on the stage area by using mouse wheel scroller to seamlessly zoom in and out of the stage. You can pan around the stage area by clicking on the stage area background and holding down the left mouse button and move the mouse in the desired pan direction. As for the "2D" mode you can zoom in and out on the stage area by using the mouse wheel to zoom in and out. You can pan around the stage area by clicking on the stage area background and holding down the left mouse button and move the mouse in the desired direction. If you click and hold the right mouse button while moving the mouse pointer sideways either left or right it will then rotate the 3D view around. If you move the mouse pointer upwards or downwards while holding the right mouse button down you will then tilt the 3D view up or down. Undo / Redo - Undo or Redo up to the last twenty (20) operations. You can also press CTRL-Z for Undo, and CTRL-Y for Redo. Asset Picker - Will display the asset library, see the Asset Picker section for more information. Cut Connection - Will cut the connection you click on after selecting the tool, and create two individual connections.. Ports - Will display the port placement area on screen. See the Port section. Multiple Select - Toggles the selection rectangle for multiple object/connection selection. You can also press down the ALT key when clicking to add or remove individual items for the selection. Zoom In / Zoom Out - Allows you to zoom seamlessly in or out on the stage for a more detailed view. 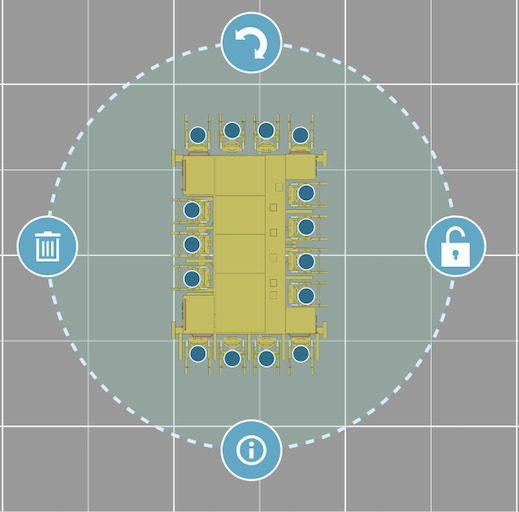 Zoom Extent - Automatically zooms the view outwards to fit all deployed assets/vessels/connections on the stage. Text Tool - Allows you to freely place text anywhere on the stage. See the Text Tool section for further details. 3D Mode - Changes the view from 2D Layout Mode to 3D View Mode. Zoom Extent - Automatically zooms the view outwards to fit all deployed assets/connections on the stage. Note! Zoom Extent only applies for "Subsea View" at the moment. Topside - Will move the 3D camera view topside e.g. above sea level. Subsea - Will move the 3D camera view subsea e.g. below sea level. 2D Mode - Changes the view from 3D View Mode to 2D Layout Mode. Move Asset - Enables selection of asset for a 3D move operation. Rotate Asset - Enables selection of asset for a 3D rotate operation. Reservoir Mode - Enables 3D Reservoir mode. FPS Camera - Enables FPS Camera for 3D scene flythrough useful for screen recordings. This will reveal the asset library selector catalog as shown below. You can have multiple asset libraries including private asset libraries for your own company that depicts your own equipment or vessels. The assets are categorized in: "Structures" and "Vessels"*. The number of assets currently in each category is shown behind the category name. Future updates will bring more assets and asset types. Default libraries available are "Generic" and "User" libraries. 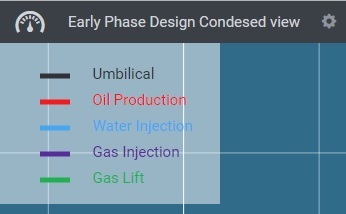 The generic library is comprised of the most common subsea and topside assets and in addition various vessels. The "User" library is comprised of your own defined assets that have been added into this library from the asset editor. There is a Quick search field at the very top next to the Assets heading. 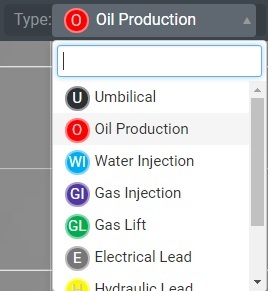 Simply start typing part of an equipment name or category and the selection will automatically get narrowed down for quick and easy asset selection as shown in the image above using xm as a search term. To add an asset to your field layout design in the "Stage Area", simply click it and hold down the left mouse button while you drag it out of the asset list selector and onto the stage area and release the mouse button. To reposition the asset just click again on the active asset and hold the left mouse button down while you move it to the new position on the stage and release the mouse button. 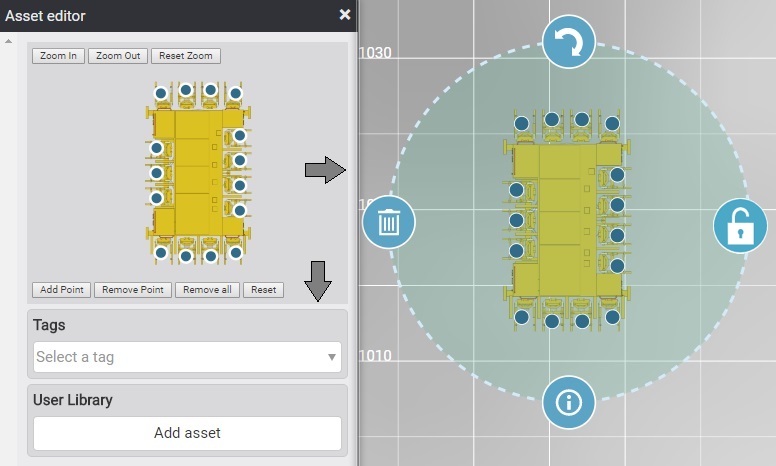 Now you can easily select multiple assets and connections by using the new selection rectangle and move all selected objects to a new location. If you select just connections, every connection that intersects with the multiple selection area will be selected. Once the selection is complete, you can click on one of the selected connections and move the entire selection set around and all connections will follow. Press and hold down the "ALT" key and the click on individual assets/connections to add/remove it to/from the selection. Just mark the area you want to select and press "CTRL-C" for copy, "CTRL-V" for paste, "DEL" for delete or press any of the selected assets and move them on the stage. To rotate just hold down "SHIFT", and rotate the selection by pressing left mouse button and moving the mouse pointer in the desired direction. You can copy and paste assets between individual project tabs, and even copy paste individual assets between different projects. When pasting an asset it will appear where you have the mouse pointer positioned on the layout area. So if you want to paste multiple copies of an asset on stage simply move the mouse around to the desired position and press CTRL-V at each location. You can enlarge the Editor window by positioning the mouse pointer at the window edges as indicated by the grey arrows shown above. This will change the moouse pointer to a resize icon and then simply enlarge the window either vertically or horizontally to get a larger edit area. Use the Zoom In and Zoom Out button to enlarge/reduce the asset size, or press Reset Zoom to go back to default. You can also use the mouse scroll wheel to zoom in/out on the asset. You can also click and drag the asset around in the editor window. 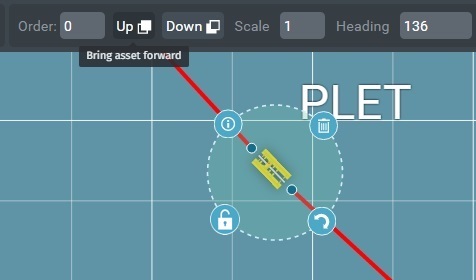 To add a new Connection Point to the select asset shown in the editor, simply click on the Add Point button below the editor. This will create a new connection point in the center of the asset. To position the new point simply click on it, and while holding the left mouse button pressed you can freely move the point around. When you have found the desired position simply release the mouse button again. You can also re-position any other connection point the same way by clicking on it to select it and moving it around whilst you keep the left mouse button pressed. 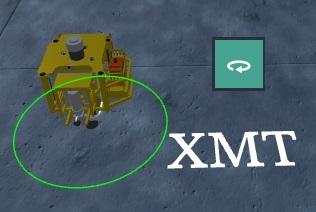 And when a connection point is selected it can be deleted by pressing on the Remove Point button below the asset editor window! Press Remove all to delete all connection points for the asset so you can start the connection point layout process from scratch. Pressing the Reset button will restore the original number of connection points and position from the database. When a connection point is selected you can select the type of connection you want to allow from the list below Connection type. Selecting this means that this connection will then only accept e.g. Oil Production and so on. For more on connection types, please see Project Settings. You can also specify the connection point Depth value in meters, and the Orientation of the connection to be either horizontal or vertical. When satisfied with the changes simply click on the "Close editor" button, click outside into the stage area or press the "x" icon in the top right corner. If a connection is selected when you open the Editor you have the ability to select the Connection system as shown below. 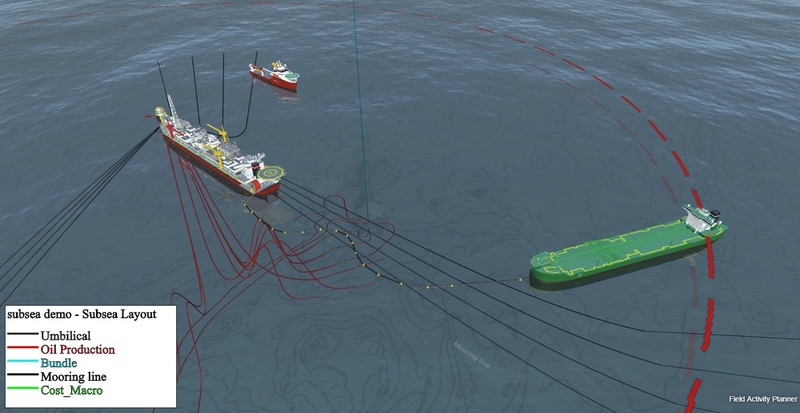 The connection system options differs based on if you have connected topside to subsea asset (Riser), or subsea to subsea asset (Jumper). Below the Connection System selection you will see that three (3) riser control points are generated on the connection. To control the Z value (depth) of the curvature points (A, B, and C) use the corresponding depth numerical input fields as shown in the leftmost illustration above. Once you are satisfied you can then switch to 3D view to see your riser creation. At the moment you can select between; Jumper - Vertical M, Jumper - Vertical N, and Jumper - Horizontal Z. 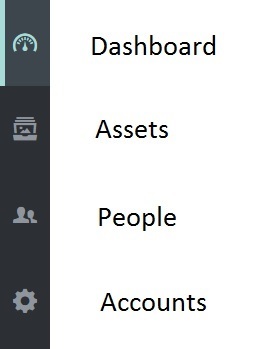 All the meta data types you defined in the "Account settings" on assets, connections and connectors will be shown here available for user input/selection. If you press or create a new connection point and choose a type, the meta data associated with that type will be available for input. The meta data types for the selected asset will be listed as shown below. In the list shown above we have input some sample data on different meta data types defined for the 4 slot template. 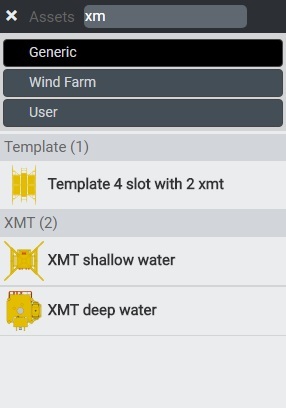 Because we made a meta data type called wellhead on the asset "XMT deep water" that we set as data type "Asset" we are able to link in the wellhead asset and thereby inherit that assets meta data types as well. When you are done specifying your asset with your selected meta data you can put it back to your personal asset library by clicking the "Add asset" button in the bottom of the list. If you want to add meta data to connections just click the connection editor and do the same as for the asset itself. 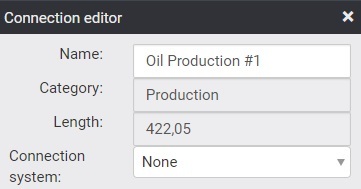 If you have costs associated with your meta data types all the costs gets computed in the cost equipment module by pressing the button called "Server". In the cost breakdown you can see what types of metadata is included for the cost calculation invoked by the "Server" button. You can easily move an asset by first clicking on the desired asset. That will display a dotted circle around the asset with three (4) icons. 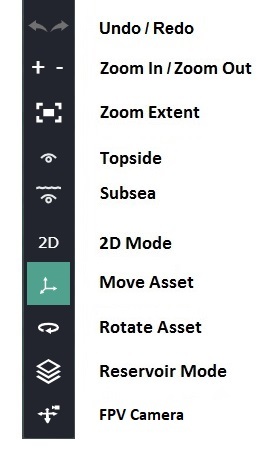 These icons will allow you to respectively "Rotate", "Delete", "Display" or "Lock" the asset meta data. To "Move", simply click anywhere within the circle and hold the left mouse button down while you move the asset to your desired location and release the button. 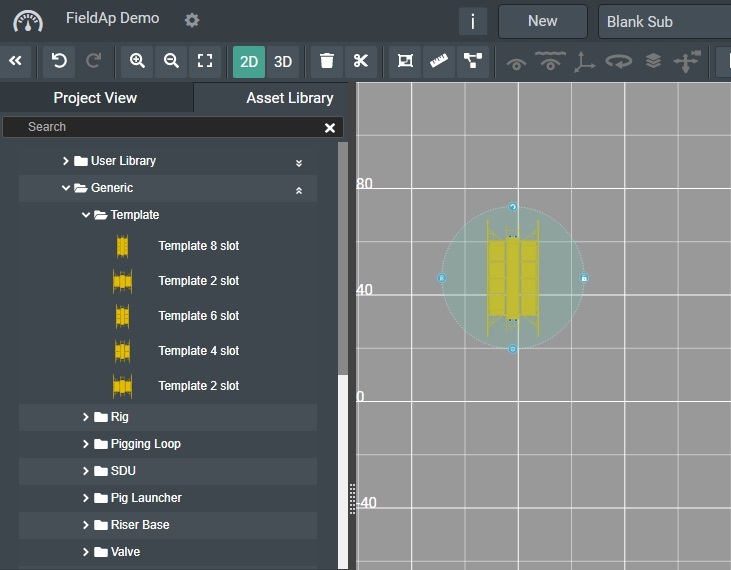 You can move an asset in 3D view by selecting the Move icon from the 3D Stage Toolbar. Then click on the desired 3D asset or text object to move. Use the 3D arrow object helper to move your asset to the desired position. To "Move", simply position your mouse cursor over the 3D move helper object and if you are over the arrows they will light up. Clicking and holding the left mouse button over the desired arrow will perform a fixed move in that direction. If you select the filled square area at the arrow intersection on the 3D move object helper you can freely move the desired asset or text around. Release the mouse button once you have your desired location. You can easily rotate an asset by first clicking on the desired asset. That will display a dotted circle around the asset with three (4) icons. 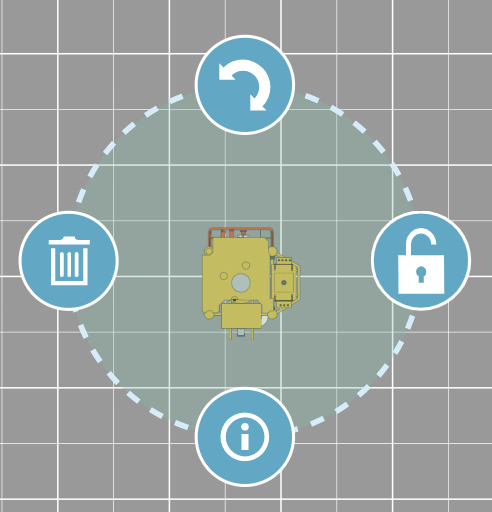 These icons will allow you to respectively "Rotate", "Delete", "Display" or "Lock" the asset meta data. To "Rotate", simply press the rotate icon and hold the left mouse button down while you rotate the asset to your desired angle and release the button. You can rotate an asset in 3D view by selecting the rotate icon from the 3D Stage Toolbar. Then click on the desired 3D asset or text object. That will display a circle around the asset. To "Rotate", simply press the 3D circle helper object and hold the left mouse button down while you rotate the asset to your desired angle and release the button. To "Delete" an asset, simply click on the "Trashcan" icon and the asset will be removed from the stage. To "Lock" an asset, simply click on the "Lock" icon and the asset will be Locked in the stage. Tick the Display option to the left of the Asset name to have it displayed on stage. The name can be freely repositioned on stage simply by selecting it and moved around. You can also change the label Font Size using the edit field, and also change the Color of the label text by using the color picker as shown below. The Reset button, will set all values back to default. Field Activity Planner comes with a set of the most typical generic assets that can be used for a simple field layout. 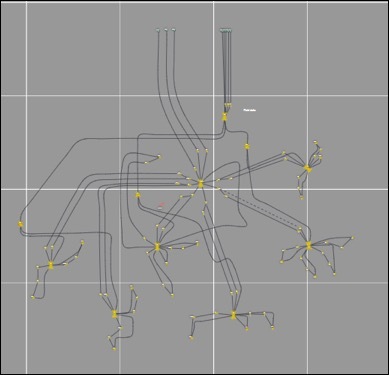 Most of these assets can be connected to each other as would be expected for a field layout. 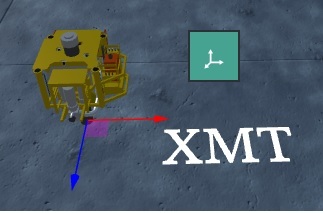 To make a connection between two (2) assets or structures you need to click once on the starting connection point once the mouse cursor changes to a "cross selector". Then move the mouse over to the asset connection point that you want to connect to and click once again when the "cross selector cursor" is shown. The assets will then be connected together. Also, whenever a connection is selected the cross selector indicator will be shown and allow you to move a connection to a different connection point at any time. If this option is selected under the stage settings you will not be able to make a connection on an asset, when the asset is in selected mode. If you uncheck it then you can make connection regardless of the asset state. If you click on the connection line itself between two assets, you can add curvature edit points, which allows you to modify the layout of the connection line. You will see a small "+" symbol next to the mouse pointer that indicates that by a left mouse click a curve edit point will be added. To remove an edit point from the connector press and hold the "Shift" key and select the edit point on the connector. To name a connection simply enter the desired name in the text edit box next to the "NAME" label. If you want the name to be displayed on next to the connection on stage just press the "Display label" button. You can position the label where you want by clicking it and then move it to the desiered location. To display the length of a connection tick the selection box in front of the Length field and it will be shown after the connection name. To remove a connection, click on the "Trashcan" icon on the connection edit toolbar as illustrated below. 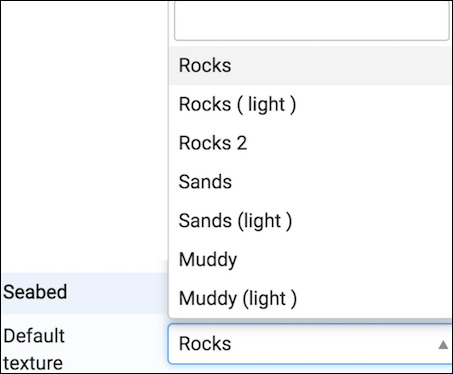 To select a connection type, simply click on the Type drop-down-list and select the desired one as shown below. Any new connections you make will then be of this type, or if you have a connection selected it will become the new type! The top entry is a quick search field to allow you to narrow down the selection. Note! In the project settings you can change the default connection types e.g. color, labeling etc. See more information under Project Settings! You can also choose the connection line thickness or width on an individual connection by selecting the appropriate thickness from the Style slider, or enter teh desired numerical value in the edit field to the right. The dashed line pattern button allows you to toggle between a dashed or solid line type for the selected connection. When you have selected a connection, the length of the connection in meters will be displayed in Length field. 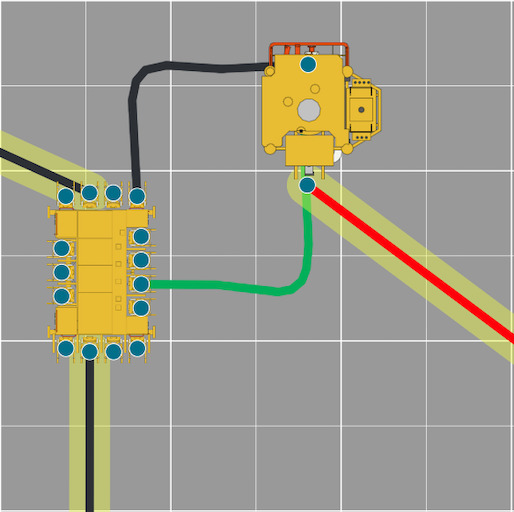 If you move an asset with a connection attached, or edit the connection path the length will be automatically calculated and shown. 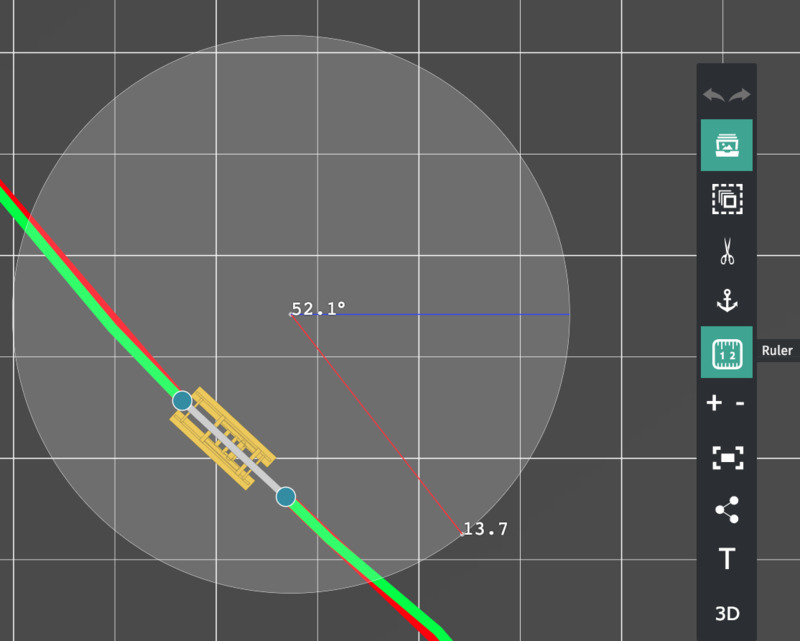 The length field is automatically updated for in both 2D and 3D View mode. Tick the Display option to the left of the connection name to have it displayed on stage. To display the connection length, tick the Length option. The name and length text lables can be freely repositioned on stage. You can also change the label Font Size, and change the Color of the label text by using the color picker as shown below. The Reset button, will set all values back to default. The "Order" control will appear on the top toolbar when either an asset or connection is selected. You can assign a draw order number or value if you will either directly in the "Order" edit field, or use by clicking on the Up or Down icons, which respectively will add or subtract the current draw order value by one (1). The current field layout is always rendered "bottom up" e.g. with the lowest order number renders first meaning the -1 gets rendered before 0 and so on. At the moment the order functionality allows assignment of numerical values between -99 to 99. See the image below to see two connections change render order based on Order value assignments. 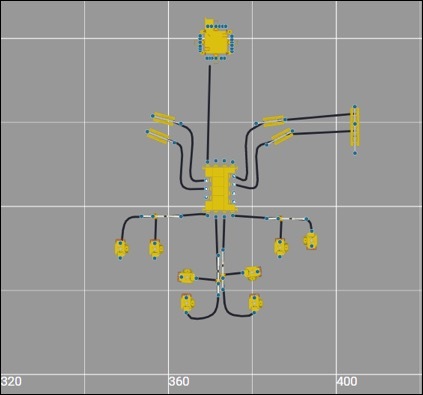 The new MBR (read: Minimum Bend Radius) module facilitates accelerated pipe design layout that enforces user defined design restrictions such as “Bending radius” and “Bend length”. This is achieved by the display of a bend radius circles when a pipe or connection needs to have a bend. The pipe will then curve around the defined bend radius set in meters until it continues its path until the need for the next bend. The circles can also be freely positioned and moved around for design tweaking. For each such pipe design the system will remember all bend radius circles and will display them again when the pipe (connection) is selected so they can be further edited by the user. Sometimes you might find it useful to scale an asset on stage up or down e.g. increase/decrease it from its original size to better depict realistic and relative sizes. You can now do this by simply selecting an asset and then input a new value in the "Scale" edit box. You can also increase/decrease the value by using the up/down arrow icons in the box when selected. The default scale size for an asset is usually 1.0. You can also specify the heading of an asset in degrees. Simply select an asset and then input a new value in the "Heading" edit box. You can also increase/decrease the value by using the up/down arrow icons in the box when selected. The default heading size for an asset is usually 0. 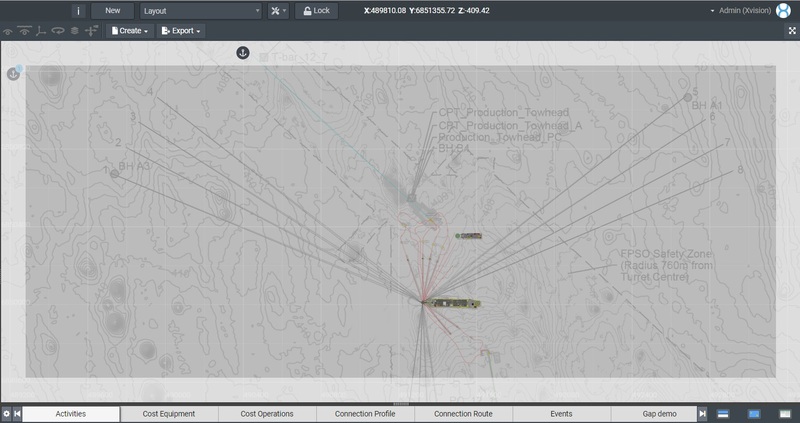 To better and more accurately visualize marine operations and installation planning - FieldAP has built in functionality for port related vessels activity management. To access the port functionality, simply click on the "Port" icon in the "Stage Toolbar". Clicking on the "Port" icon will display the port layout area on the stage illustrated by a semi-transparent border area surrounding the stage with a movable port icon that can be placed anywhere in the border area. Simply move the mouse around and the port icon to be placed will move around the rectangular border until you have your desired position, and click the left mouse button. 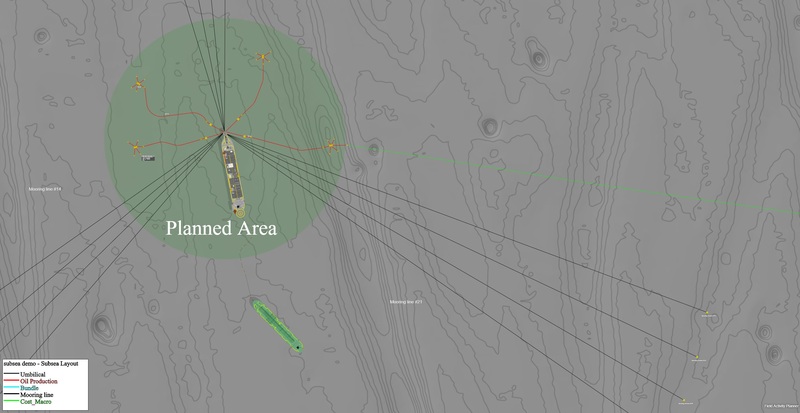 Normally each side of the rectangle will also represent a heading for the port for more accurate visualization of marine operations e.g. left border equals "West", the top border area equals "North" and so forth. You will then be presented with a "Port" icon and the possibility to name your port. To do this, simply type in the desired port name in the "Edit field", and click on the "Save" button. To "Delete" the port, simply click on the "Trashcan" icon. With "Ports" functionality you can now visualize task such as "Mobilizing", "Transit" from/to port etc. in your "Activity Planning", and it will be likewise indicated when you "Play" or operate the time-line function. To access or to assign an activity to an asset docked in port, simply click on a port icon, and the port dialog will appear. From the port dialog you can select a vessel for an activity, delete a vessel by clicking on the trashcan icon next to its name, or you can select a vessel using your mouse and dragging it back onto the stage to undock it. You can also edit the port name. You can measure the distance and view the angle between two points on the map(in 2D) by pressing the "Measure Distance" Button and then press the stage area where you want the measure to start and then on stage where you want the measure to end. The radius can be determined for e.g. ships or radars for diferent purposes such as safty distance. Using the new "Text Tool" you have the ability to freely annotate your field layouts at any position on the stage. To add a text/comment etc. simply select the "T" symbol from the toolbox and click anywhere on the field. This will add the text "Text" on your layout at the position you clicked on the stage. Click on it and you can use the toolbar at the top of the screen to quickly edit the text, change the font size or text color. If you wish to write a longer text simply double click on the text to display an "edit dialog" on screen where you can add multiple lines of text. After adding your text, simply click "Save" to add your text, or click "Cancel" to exit! 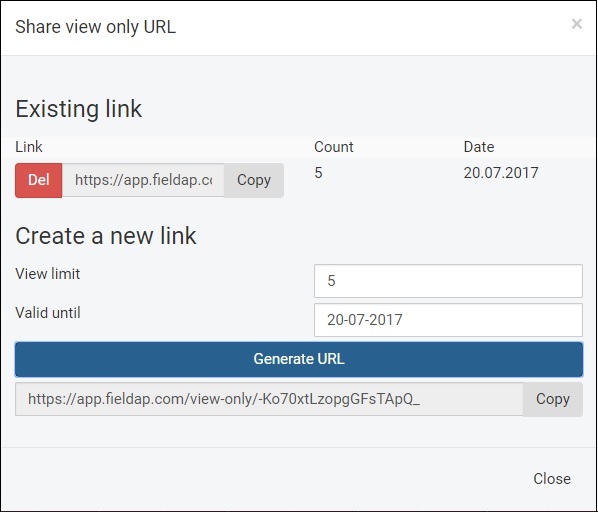 The Get Link feature allows you to generate a URL that can be distributed in emails, linked to images in MS PowerPoint presentations etc. To access this feature, select your user settings on the top right-hand side and choose "Get Link" from the menu as shown below. 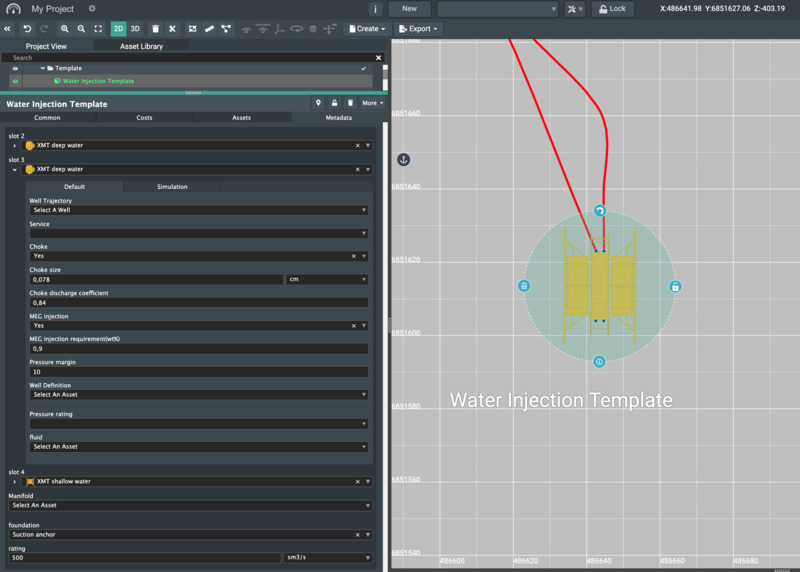 You can also control the “Water opacity” setting so that the seabed and subsea layout is visible from the surface as shown in the next illustration. 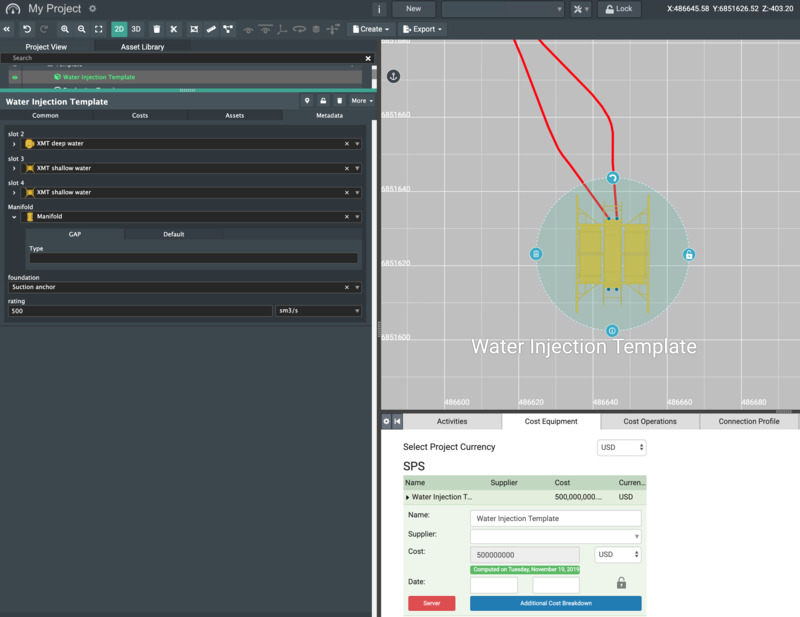 You no longer need to select “Subsea” view from the toolbar, and can see topside and subsea in a single view. With FieldAP real time collaborative capabilities, you can be on the phone with the recipient of the link and then from your own browser drive the session and take them through the layout and interact with it at will to show more details. 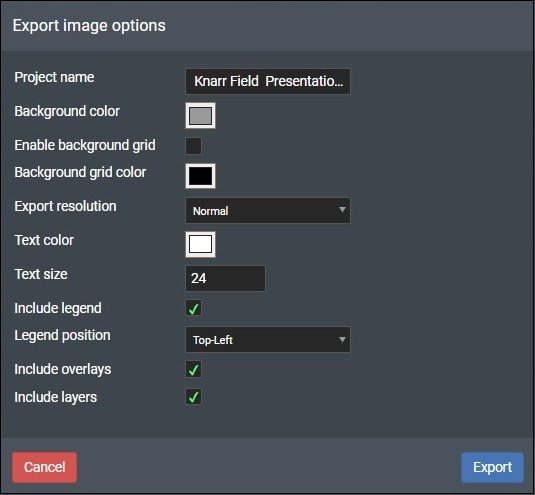 Using FieldAPs' "Export" functionality you can at any time save a screenshot of the current 2D or 3D stage view as an image file that can then be included in a presentation, document, email etc. to showcase your layout/design to others. To access this functionality, click on the "User" settings located in the top right corner. The dialog will allow you to edit the project name to be included when rendering the exported png file. You will also find setting for specifying the background color and include the background grid and set its color. You can also specify the image output resolution as either "Low", "Normal" and "High". To increase legibility you can specify both Text color and Text size for all text labels. To add Legend description for the connection types that have been defined for the project tick the Include legend box. Only the connections used in the active project or sub-project will be included in the legend! You can also set the location for the Legend Position selecting between Top/Bottom, Left/Right. Click on "Include overlay" box to have any annotation/comments made by the "Text tool" included in the Export. Finally, click on "Include layers" box to have any background imagery added in the Layer module included in the Export. The dialog will allow you to edit the project name to be included when rendering the 3D view to the exported .jpg file. To add a Legend description for the connection types that have been defined for the project tick the Include legend box. Only the connections used in the active project or sub-project will be included in the legend! You can also set the location for the Legend Position selecting between Top/Bottom, Left/Right. The first step when creating a new project in the Field Activity Planner is typically to design a new field layout. To achieve this you can quickly and easily design the wanted field layout by using the "Field Layout" designer tools. The "Asset Library" will be where all the available design elements with their respective meta data will be stored. 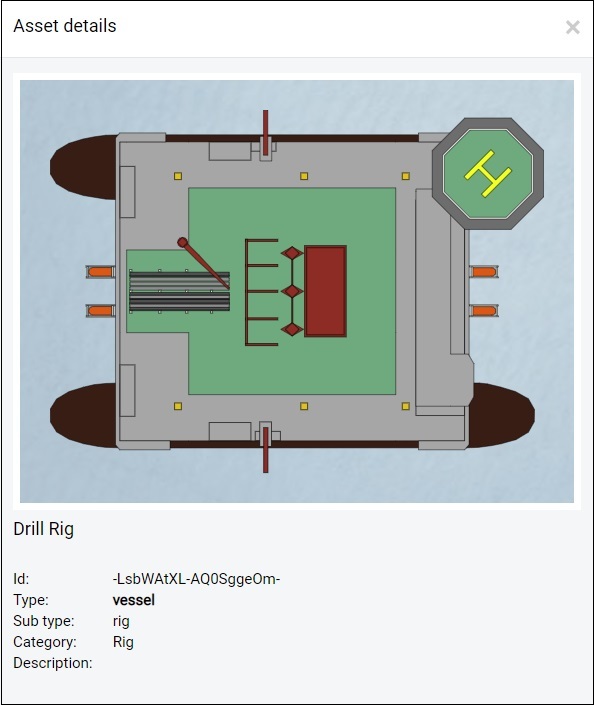 Assets will typically be design elements that depict subsea installation structures or other operational equipment such as "Manifolds", "Templates", "FPSOs" etc. At the moment "Field Activity Planner" comes with a generic library of the most commonly used structures and vessels, but we will soon provide additional libraries. In addition we will also offer the capability to add your own custom assets and meta data to the "Asset Library". 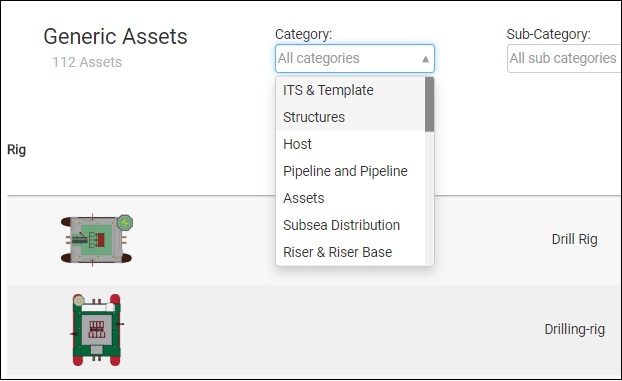 Simply select the asset category from the drop down list to display that category. At present only the "Structures" and "Vessel" categories are available. To see all registered details on an individual asset, simply click om the "Asset" image card. This will display a dialog with all the asset details registered as shown below. The project menu bar is comprised of the "Dashboard" button, "Project Name/Settings", "Sub-project List", and "User" menu. To return to the project dashboard just press the "Dashboard button". Note! Your project auto-saves continuously so everything you have done is always saved. On the lower navigation bar pn the right hand side you can find the "View" control that will toggle between the three (3) different application views available to you. The FieldAp "/Split" view displays both the "Stage" area and the Active Module e.g. "Timeline(Gantt)", "Cost" etc. module at the same time. Selecting the "Stage" view hides the "Active Module" from view so that the entire application view is used for "Stage" layout. 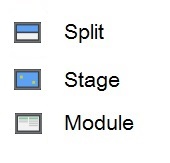 The "Module" view will hide the "Stage" area so that the entire application screen is used for the "Active Module" view. 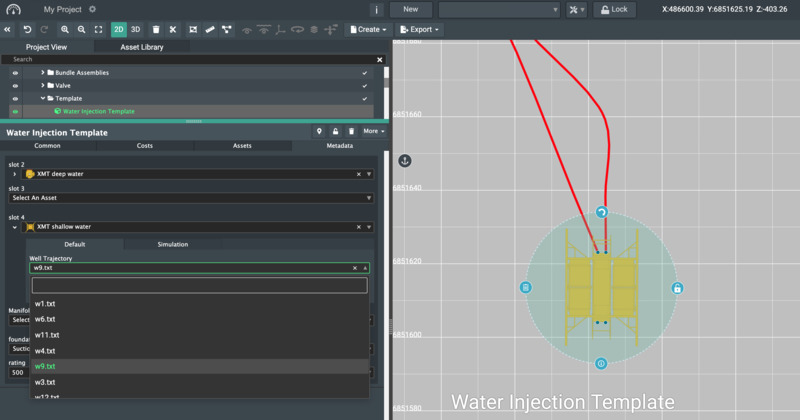 The Stage settings allows you to define the 2D Stage settings for the current active sub-project, set Bathymetry and Water Opacity, control the Stage View Scale, and control various Connection display settings. Click on the color picker to display the dialog where you can select the desired background color for you current project tab view. You can revert to default any time by clicking the Reset button. Click on the color picker to display the dialog where you can select the desired grid line color for you current sub-project. You can revert to default any time by clicking the Reset button. The Visible checkbox will display grid-lines if checked. 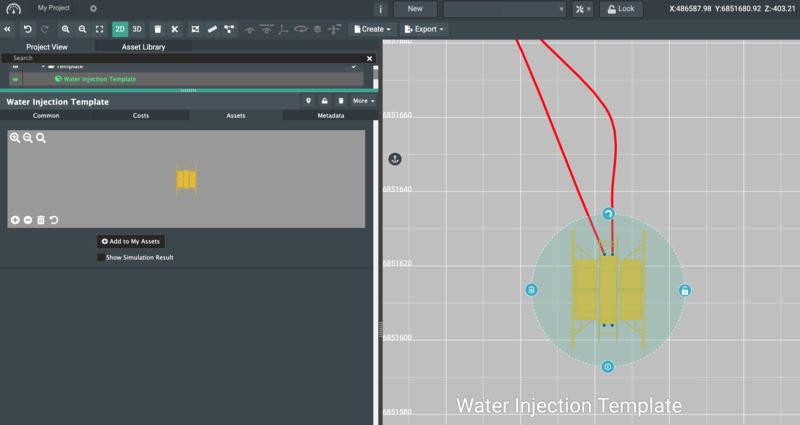 The Opacity slider allows you to define the water transparency value from 0,1 to 1. Where a value of 0.1 is fully transparent and a value of 1 is completely non-transparent. Note! Applies to 3D view only. These settings allow you to adjust the horizontal and vertical scale of the stage for both 2D and 3D Note! These settings are global for the project e.g. they are valid for all sub projects tabs that you have. The Horizontal scale factor slider allows you to define the horizontal scale value from 0,1 to 1. Where a value of 0.1 is an extremely condensed view, and a value if 1 equates Real world scale. The Vertical scale factor slider allows you to define the vertical scale value from 0,1 to 1. Where a value of 0.1 is an extremely condensed view, and a value if 1 equates Real world scale. The Do not apply to to text setting if checked ensures that the text size will automatically scale along with the "Horizontal scale setting". The Dynamic Scaling is a new function that improves rendition for field layouts to ensure better visibility for all assets, connections etc. when zooming out. When this function is enabled it will apply scaling that follows the zoom out function to retain visibility. As an example, the screenshot below to the left is how a sample project in Field Activity Planner looks like when zoomed to extent. The screenshot to the right shows the exact same field layout but with Dynamic Scaling enabled. The dynamic scaling feature thus ensures much better visibility overall for assets and connections when applied. Deafult texture Use the drop-down list to select the default seabed texture for your project. Available options are; various Rock options and Sand. Enable this option to have the connection angle values displayed in degrees on stage. If this option is checked, you are unable to make a connection on the asset, when it is selected. If unchecked it will allow you to make Connections even when selected. 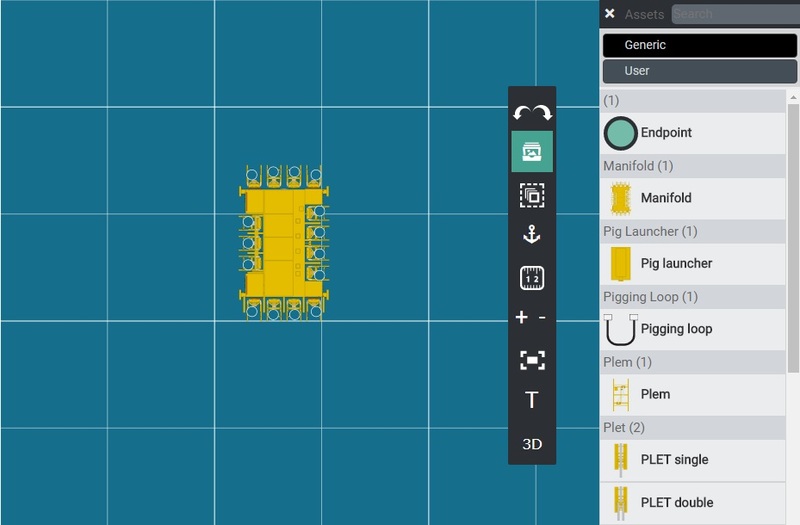 Enable this option to display the flow direction of all connections in your project. The direction is initially set when you connect a connection to an asset. The first connection you make is the “From” point and defines the flow direction. 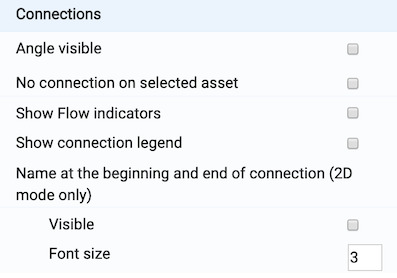 To visualize the “Flow Direction” enable the “Show Flow Indicators "under the “Connections” section in the “Settings” tab as shown below. 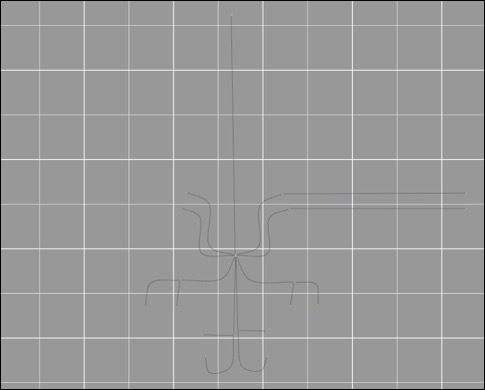 You will then see directional arrows signifying the flow direction for every connection as illustrated in the screenshot below. 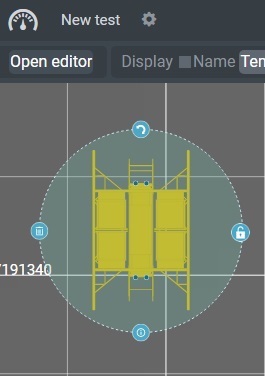 Enable this option to display the “Connection Legend” on stage in the upper left corner of the stage display in both 2D & 3D view. For very long connections it was hard to see what the connection name/description should be when tied to an asset unless it is selected. Check the Visible option to display the connection name on both endpoints in addition to the middle of the connection if enabled. Note! Only the middle connection name can be freely positioned. Use the Font Size option to change the size of the endpoint text. You can add project information for the current sub-project, by pressing the "i" button above. This will present you with a new dialog where you can add text/notes describing the current sub project. You can easily create several versions of a project, or sub-projects (views) if you will of a field layout for the same project by using the New command. Simply press the New button as shown above. This presents the following dialog allowing you to "Add sub-project". Simply type in the name for the new sub-project, and press "Save" . This will create a new Sub-project. Or press "Cancel" to abort! You can switch between the various Sub-projects by selecting from the sub project drop down list as shown here. The topmost entry is a quick search field that you can start to type in to narrow down the selection if you have many Sub-projects. If you want to create a copy or a clone of the active sub-project, simply write in the new desired name in the Name field, and then select the Clone button. Note the Clone to project drop-down-list. 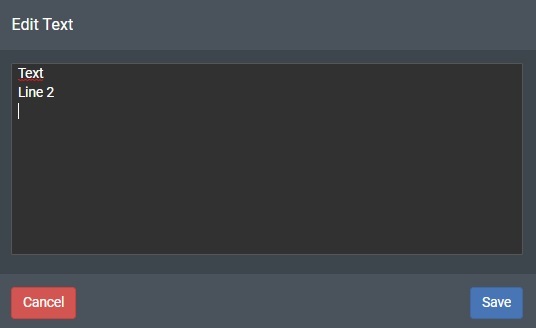 This is set to your current project by default, but allows you to clone your current sub-project into another project, which is very useful if you want to reuse a field layout again in another project. To rename a sub-project simply change the name in the edit box and press Save. To remove a sub-project simply press the "Delete" button. Note! This action cannot be undone! Pressing Cancel will close the dialog without making any changes. Press the Lock button to prevent a sub-project to be accidentily edited by locking it down. Press Unlock to make it editable again. The Condensed View feature for project layouts is very useful when you need to have a large and complex real scale field layout represented visually. 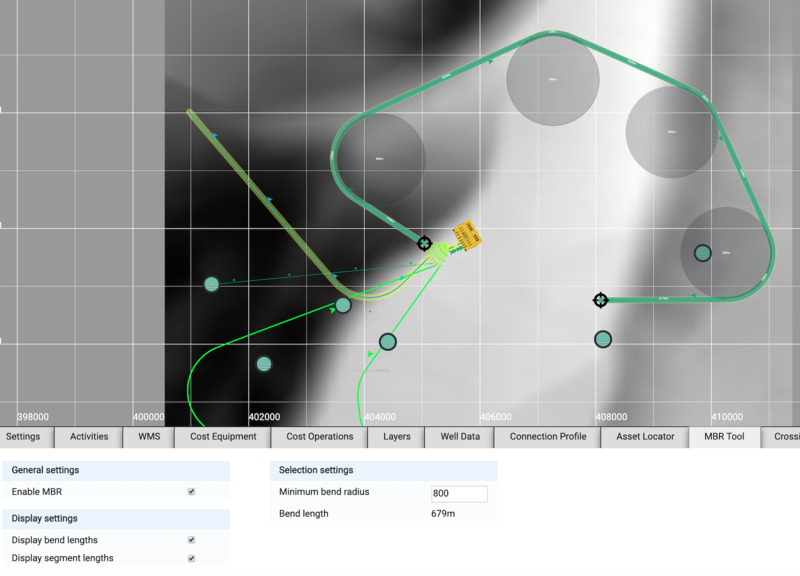 The feature will downscale the entire field layout even for very large field layouts comprised of assets, pipelines etc. to fit the current view for easy project presentation and image export for both 2D and 3D view. As an example, this sample field below which is very large geographically and is difficult to present visually when you want to see everything on screen at one time. The “Clone”, “Rename”, and “Delete” functionality remains the same. To condense the layout, click on the “Action” drop down menu, and select the “Condense” option. This will then present the following dialog asking you if you want to proceed with creating a new sub-project that will be the “condensed” view. Press “Confirm” to continue. Note! The algorithm takes several factors into account with respect to clustering and results may vary. Not every field will yield optimal results, but the condensed sub project is fully editable so you can quickly re-arrange the layout where needed for more visually pleasing results. Development is also underway on the second iteration for the algorithm so it will improve over time.